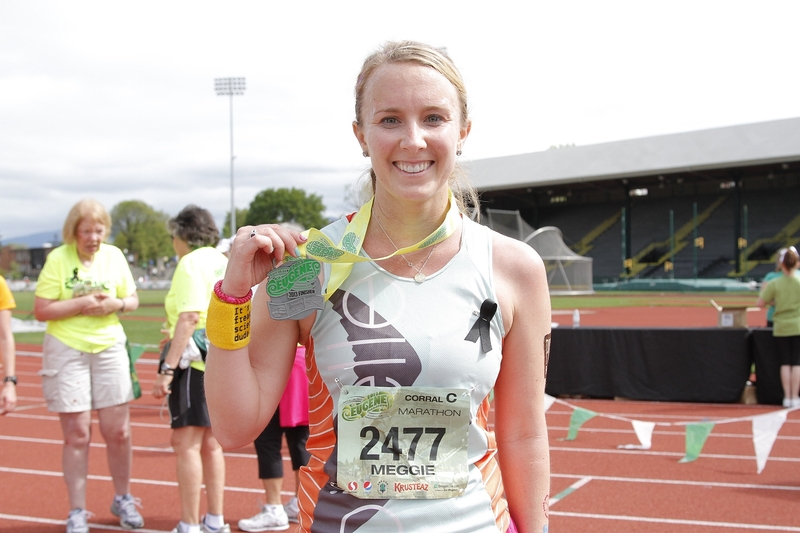 If you spoke to me around May of this year, I would have sworn up and down that Eugene was my last marathon. It’s was why I trained so hard for it, right? That last hurrah before residency? 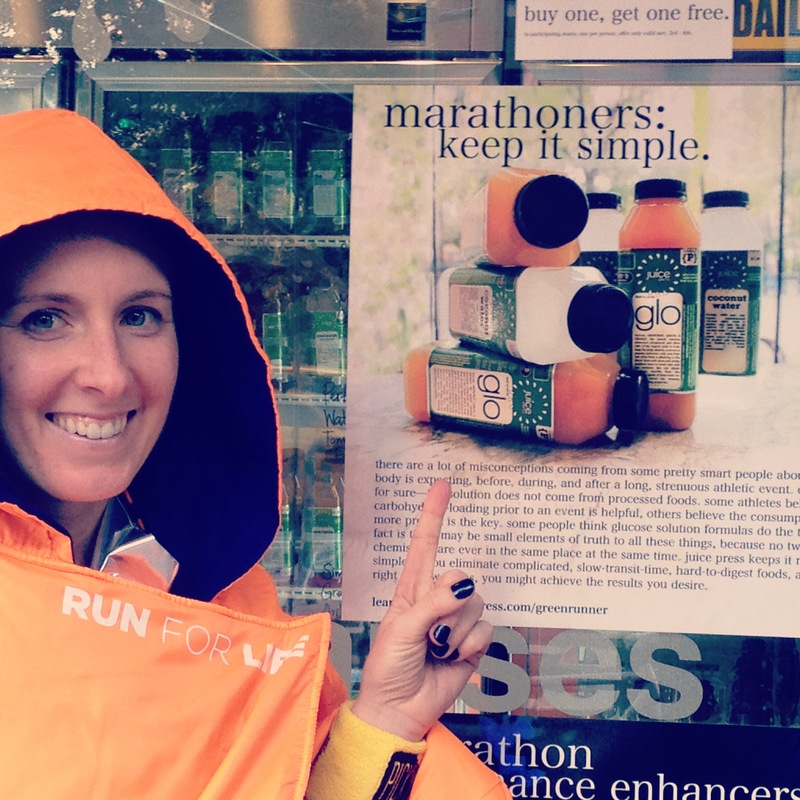 I had no intention of running the NYC Marathon for myself this year. In fact, I chose the “refund” option for my 2012 entry after the cancellation. I thought it’d be impossible to do a marathon as an intern. However, the opportunity to run for Every Mother Counts made me convince myself otherwise. After spending some time on labor and delivery, it became very apparent how dangerous pregnancy and childbirth can become in certain situations. The thought of having to walk 5k to receive basic medical care while in labor, which many rural African women have to do, fueled my desire to raise both awareness and funds for EMC, which seeks to remedy this and other barriers to prenatal and obstetrical care. One look at this video compelled me to take the plunge into another 26.2 mile journey. The more I run and the more I go through life, the more I realize that most situations are determined by how you look at them. More simply stated, attitude really is everything. So, I convinced myself that running this marathon would be a GREAT idea. I would be raising money and awareness for a great cause. It would motivate me to run on days I didn’t want to. And, best of all, I could run it with one of the coolest moms I know (besides my own mom), Gia. Residency blazed ahead a blistering pace and “training” fit in where it could. I didn’t tempo, mile repeat, long run workout, 800 repeat, or do any of the other traditional workouts one might associate with marathon training. In fact, I missed a couple of long runs. 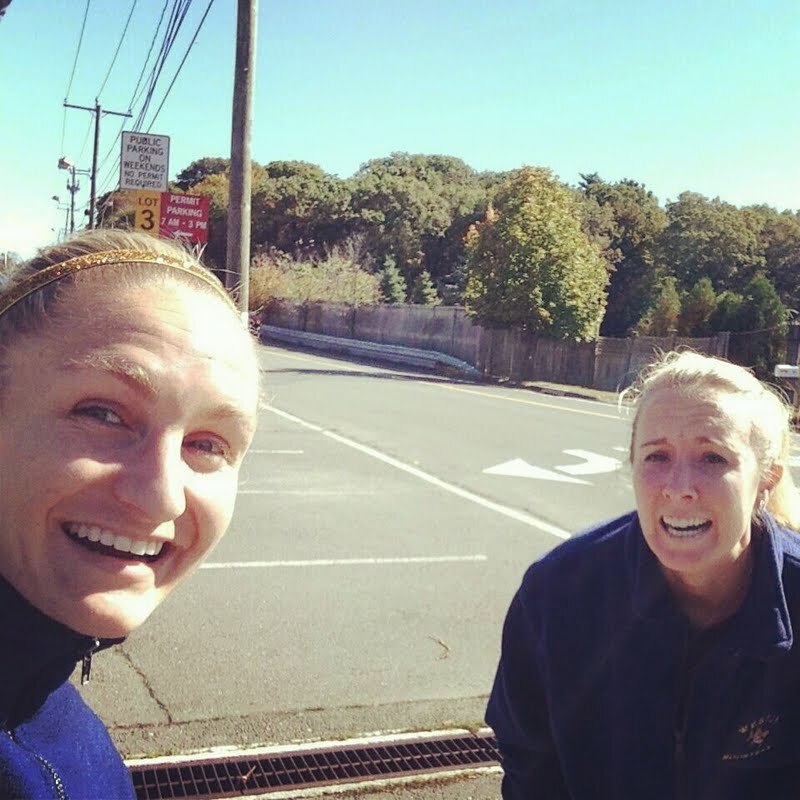 I ran or spun when I could and convinced myself that what I did was enough and that, in fact, being an OB/GYN intern was actually high intensity interval training disguised as work (which sometimes it feels like it is). By the time last Sunday arrived, I was over the moon excited – probably the most excited I had ever been for a marathon. (Or maybe I was also just really excited to have the weekend off of work…). In my “YES… I’m off all weekend” excitement, I told the “team” (Addie, KScott, and Gia) that we were going to run free and race inspired. I had the next four hours off from any thought of residency, ACGME, logging work hours in New Innovations, CREOGs/Prolog studying, cleaning my apartment, organizing the piles of stuff on my desk, answering emails of which there are too many, or any other obligation I had. The race itself was the antithesis of every other marathon I’ve run. I didn’t wear a watch. I didn’t think about a split or goal time other than the fact that I thought I’d like to finish at or just under 4 hours to save my legs the extra beating. The race started and despite all excitement and the reality that I knew I was running a marathon, the whole situation didn’t seem real. I couldn’t believe I was there. After an entire spring of proclaiming that I was done with marathons as residency wouldn’t allow time for that, here I was….running another one. Miles 1-10 were so mesmerizingly distracting that I don’t remember much about how I felt. What I do remember was how awesome the crowds were, how nice the views were, and how excited Gia and I were to see VC, G1, and G2 at mile 8. As Gia went to swoop up her two twinkles, I decided I needed a kid, too, so I gave Addie’s little Q a great big hug, which probably traumatized the poor unsuspecting kid. To be honest, around miles 10-13 I started to feel my quads ache a twinge in both my right IT band and left lateral knee. I knew at this point I had two options: freak out about it or keep moving forward. I’ve found that most of my marathons mirror what’s going on in my life at that point in time. Residency somewhat forces you to get used to this state of constant, relentless forward motion and progress. You have to keep moving. So, just like I had for the past several months as an intern, I did what I had been doing – I kept moving forward. By Mile 16 my quads were done and thus began the rest of the most painful marathon I’ve ever run. Yet, it was the most fun I’ve had running a marathon at the same time. I’m still trying to wrap my head around how that’s possible. Anyways, since I was in quad pain fest, I did have a doubt or two along the way that I would actually be able to finish. 10 miles is a long way to go on dead legs. 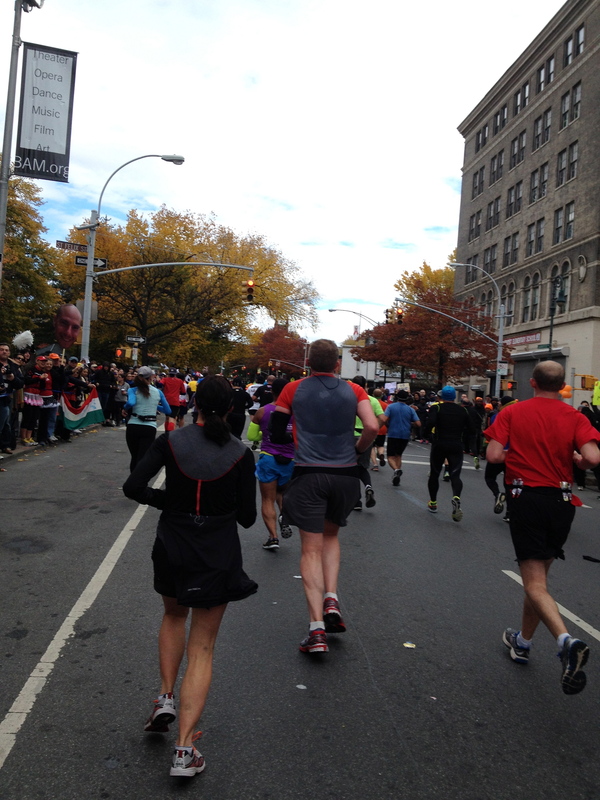 At mile 20….I actually couldn’t believe I had made it to mile 20 without cramping or collapsing. And, oddly, my overwhelming thoughts from that point forward were “you’re here! you’re doing it!” which comes straight out of Charlee’s SoulCycle class. I made the trek from Staten Island to Central Park in 3 hours 55 minutes and 43 seconds and I couldn’t be happier. 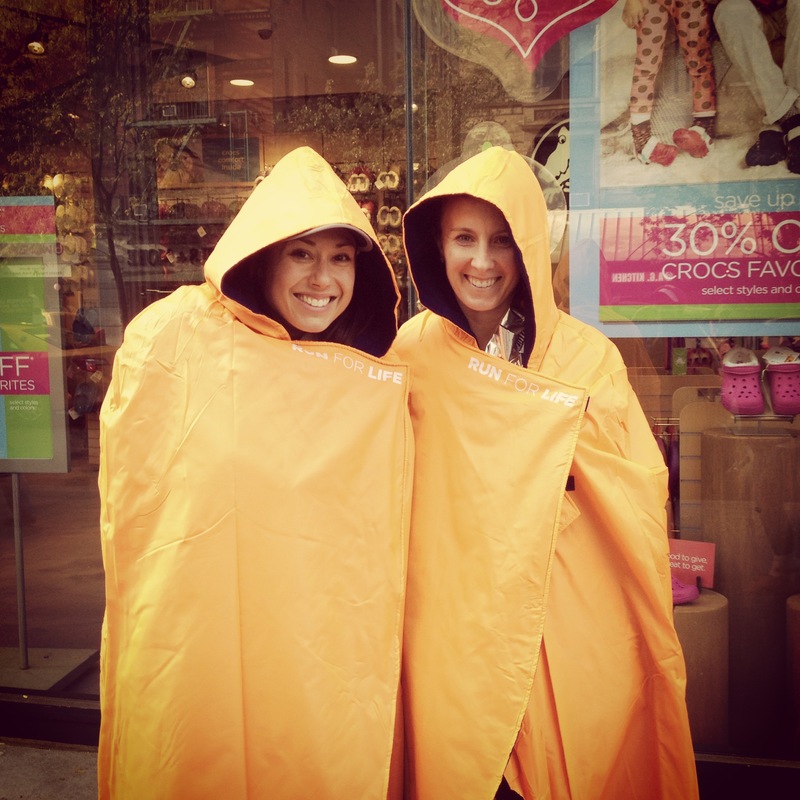 The poncho may have had something to do with that happiness. 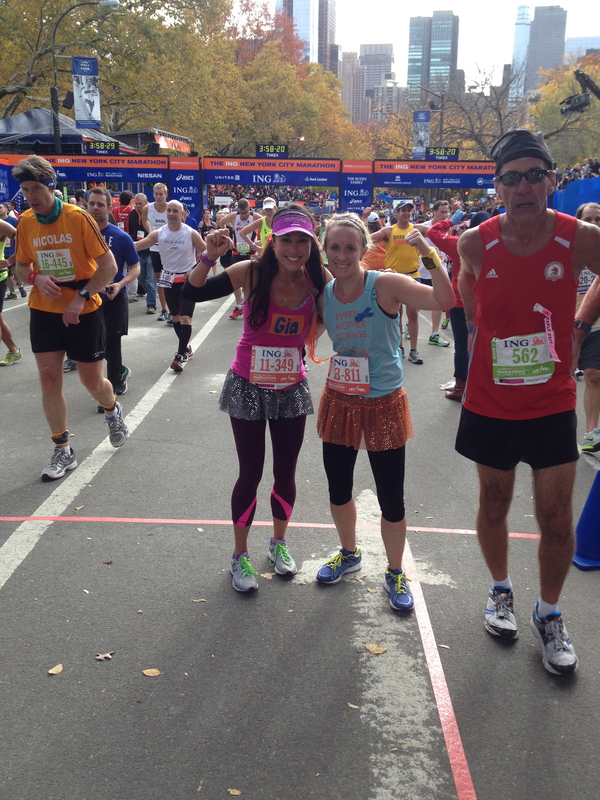 A final HUGE thank you goes to my marathon buddy and #sisterinsport, Gia. From a long run my last weekend before starting residency. 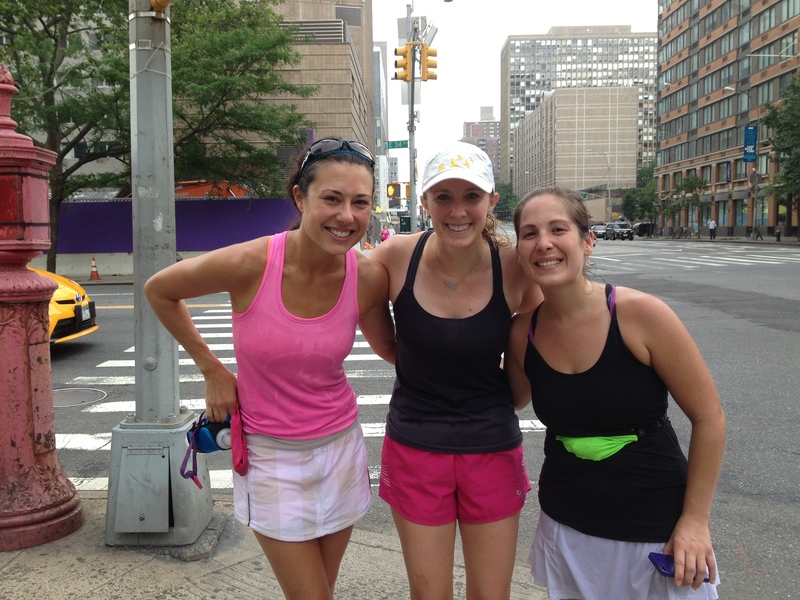 One hot day way back in July, I ran 16 miles with Gia (and RB!) as part of her Chicago marathon training.As we ran up and down the hills of the Palisades Parkway (of which there are many), I talked about how cool it would be if I did a marathon this fall “just to see if I could.” Gia encouraged me. She believed in me probably more than I did at some points. And even when I was struggling in those last 10 miles, she never left my side (despite my telling her “go! run faster!” I think every mile of the last 10). I couldn’t have picked a better friend to share 26.2 miles with. Gia, I’m lucky to call you my friend! And, finally, Jocelyn, we missed you! Come back, JCB! This is how I feel now that you live in Oregon. If you made it this far. Congratulations! This is now the end. Recap: I ran a marathon. 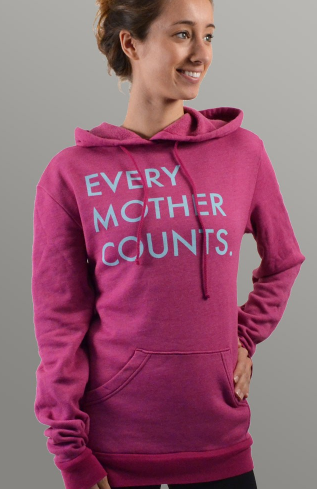 For Every Mother Counts. It hurt really badly. But, probably not as much as walking many miles while in labor. And that’s why I ran the marathon in the first place. Congratulations on your race – fantastic. And I have such bad poncho envy! Congrats on your race! Impressive time too! 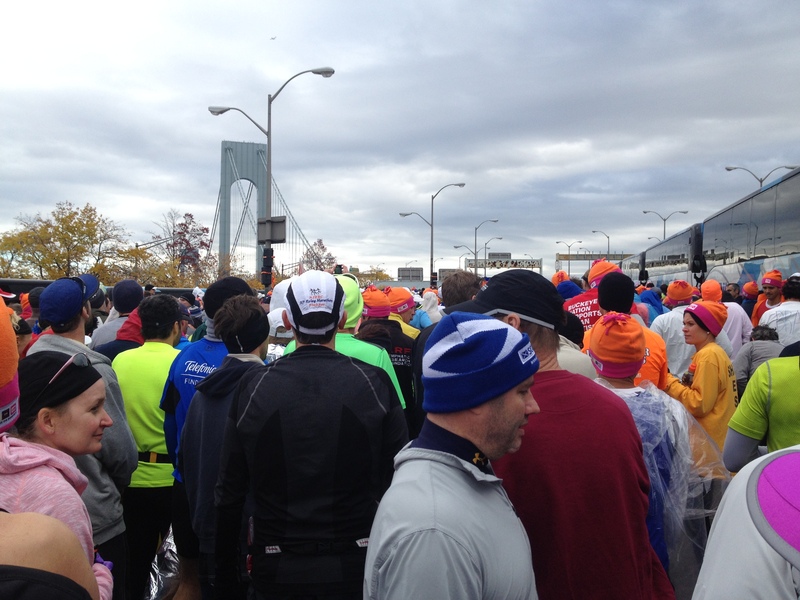 NYC Marathon is definitely on my list of marathons to run! Awesome post! Amazing that you did it during your residency. My father is a gyn oncologist in NJ (used to be in PA) but I know how hard he worked to get to where he is. I love your adventures on the blog. Congrats again! I’m a first year med student in SC and contemplated signing up for the Nike half in DC in April….for about 5 minutes. Your dedication (and time management skills, clearly) are inspiring! Congrats on a great race! After reading this, I don’t think I can ever claim to be too busy or tired to workout ever again. Congratulations! I don’t think most people can truly grasp what an accomplishment this was. As someone who just finished residency, I worked many 80+ hour weeks and could not manage to run consistently. I ran a 10 mile race a few months into intern year which ended up being the hardest race I’ve run (and one of the shortest) because I wasn’t training. Now that my residency is behind me, I still work long hours (relative to other professions) but finding the time to run is definitely easier. If you can do a marathon during internship, you can do anything! Keep it up. Hi! My name is Meggie too, and I’m new to NYC and new to blogging! 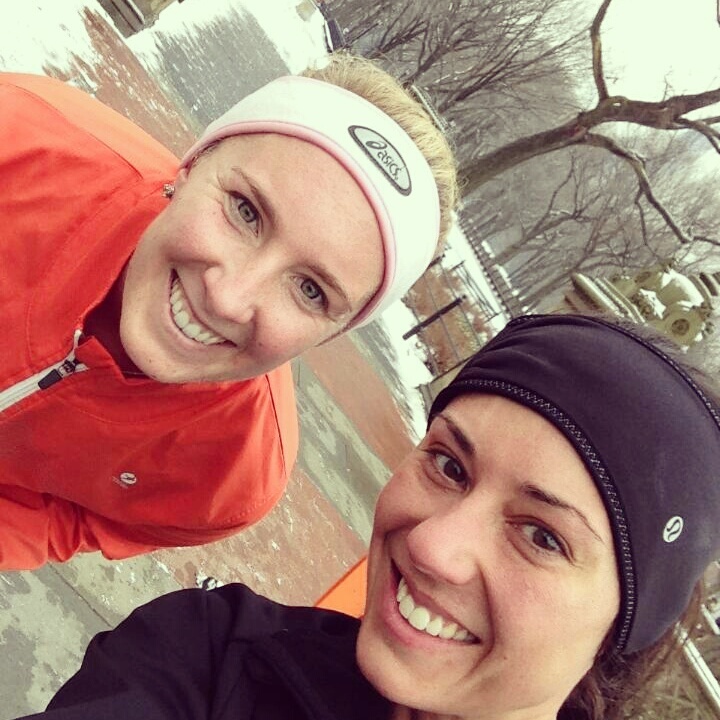 I love your blog and would love to talk more with you about the running and blogging community here!!! You looked so happy when I saw you running out there!!! 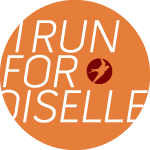 Glad you could partner with such a great charity, it makes the run mean so much more. 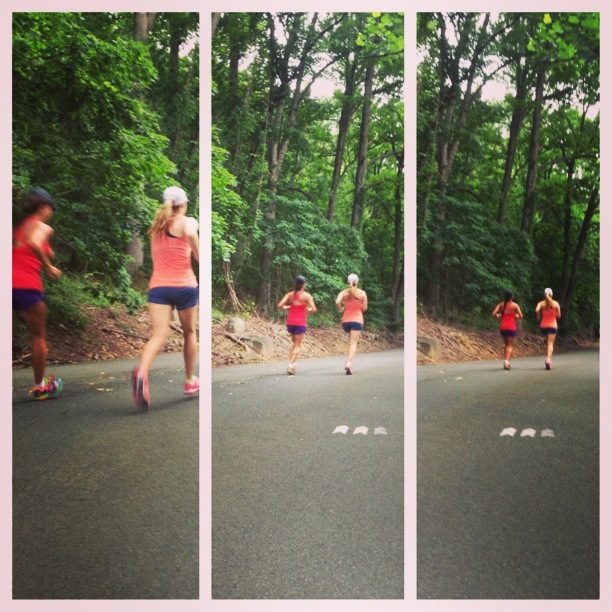 It’s fun to run a race just for fun…taking the pressure off and just going. Although I think it’s awesome to run fast and chase goals, sometimes the goal is just the finish line….such as when you’re training for your other passion 80 hours per week!